Do you need new glasses? Or do you just need to make the text bigger on your iPad? If you are having trouble making out letters and numbers on your iPad, it might be time to increase the default font size. This may not help out in everyday life, but if your main concern with your eyesight is easily reading your iPad or iPhone, this quick tutorial can certainly be cheaper than a new prescription. Unfortunately, not every app uses the dynamic font provided by the iPad, so you may not see any benefit in your favorite app. But changing the default font size works for most of the apps that come with the iPad and many others available in the app store. Next, scroll down the left-side menu and select Display & Brightness. Select the Text Size button. 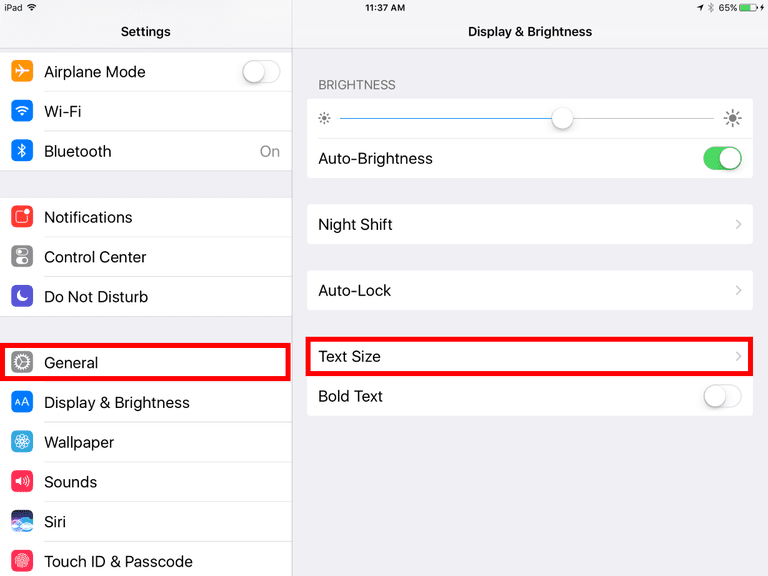 Once in the text size settings, you can make the default size larger or smaller by dragging the slider to the right or left until you find the right size. While in Display & Brightness, you will also find the ability to turn on Bold Text, which can also make text easier to read. However, this will require rebooting the iPad, and your mileage may vary, so it is best to just adjust the size of the default font first. The iPad has a lot of crazy gestures, including swiping from the bottom edge of the screen to reveal the hidden control panel. Perhaps the most useful is pinch-to-zoom. By pinching in and out with your thumb and index finger you can zoom in and out of the iPad's screen. This doesn't work in every app, but it works on most web pages and on most images. So even if changing the font size doesn't clear up every issue, the pinch-to-zoom gesture may help out. If your eyesight is really bad, it might be time to take out the digital magnifying glass. The iPad's iOS operating system has a variety of accessibility features, including the ability to quickly zoom into the screen. This works even when pinch-to-zoom doesn't work. There is also the option to zoom into just a portion of the display, which creates a virtual magnifying glass on the screen. First, go back into the Settings app. From the left-side menu, tap General and then choose Accessibility from the list. Next, tap Zoom. It is near the top of the Accessibility settings, just below VoiceOver. When you tap the on/off slider next to Zoom, you will be able to double tap the display with three fingers to enable the magnifying effect. This may take a little getting used to, so try it on this screen. Remember, you need to tap three fingers at the same time and you need to tap twice with about the same speed as a heartbeat. You can also move the zoom effect around the screen by dragging three fingers across the display. If you only want to zoom into a part of the screen, tap Zoom Region from the Zoom settings and change Full-Screen Zoom to Window Zoom. This is a useful feature to turn on while you are still in the Accessibility settings. The Magnify setting will let you easily use your iPad or iPhone's camera to magnify something in the real world such as a menu or a receipt. You'll need to be in the Accessibility settings, so if you closed out of them, open the Settings app. Tap General from the left-side menu and Accessibility from the list. Choose Magnifier from the Accessibility settings and then tap the on/off switch next to Magnifier. When you want to use your device as a magnifying glass, click the Home Button three times in a row. You will need to click it three times within about a second to engage the magnifying feature. When engaged, the camera will open and be zoomed in by about 200%.